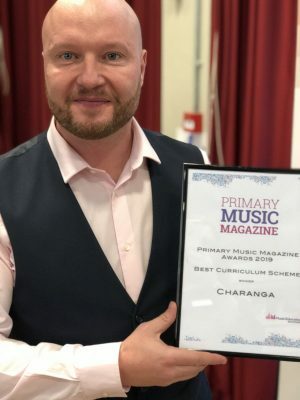 Today Charanga’s Musical School programme for primary and special schools was voted ‘Best Curriculum Scheme’ at the Primary Music Magazine Awards. The ceremony formed part of the 2019 Curriculum Music Conference, attracting leaders and teachers from music education hubs, schools and private music organisations. Musical School, a cloud-based teaching and learning resource, is one of the UK’s most popular primary school music products. Over 35,000 primary teachers are now using the exciting curriculum it offers to provide high-quality music learning in their schools. More than 100 Music Hubs have also adopted the programme as the basis for their school support activities. The award is Charanga’s third this year in recognition of its support of inclusive music and arts education in the classroom. Our International Schools programme was named ‘Best Product to Promote the Arts, Music and Drama in the Classroom’ at the 2019 Global Educational Supplies and Solutions Awards in Dubai. Charanga Take-off!, our online beginner band method, collected the ‘Outstanding Digital/Technological Resource‘ prize at the 2019 Music Teacher Awards for Excellence on 6th March. Kristian Parkes (pictured), one of Charanga’s Regional CPD & Training Managers, collected the award on behalf of the company at today’s ceremony.